I find myself writing about food a lot on this here blog. I’m starting to wonder if one could construct a whole thematic unit around the Math of Food. Or create a “meal” from appetizer, main course, and desert items. Or maybe I just need to eat breakfast. Not sure where it originated, but I found it here on one of those 99 Life Hacks! pages. 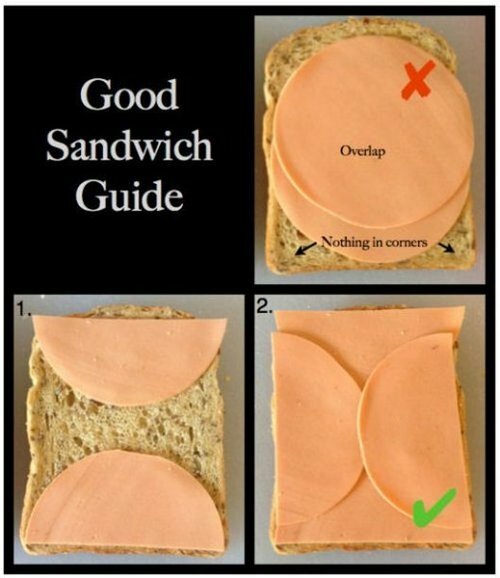 How much overlap of bologna occurs in the “traditional” versus the “life hack” method? How much area of bread is wasted in the “traditional” orientation? This seems like an investigation ripe for Geogebra. I’d also consider bringing several bread sizes and shapes. How would you orient the bologna for rectangular kinds of sandwich bread? And don’t even get me started on cheese. Previous Entry:The Problems have become self-aware: Introducing the Skynet line. Next Entry:More math food blogging: I may need some help from my Southern friends.